Use every part of the produce – even the prickly skin! We use our pineapples five ways. First off, the juice goes into our cocktail ‘Mmm Hop’, along with tree sap cordial, gin, bitter hibiscus and sparkling wine. The leftover pulp is strained, made into a syrup and added to ‘The Westwood’ – a mix of different rums and Yellow Chartreuse. Then we roast the pulp that’s left over to garnish the cocktail. After that we rip up the leaves for our ‘Vitruvian Rose Spritz’. This adds greenness and acidity to the mix of sunflower and chocolate vermouth, Ketel One Vodka, Italicus Rosolio and soda. And finally we find a way to use the skin – fermenting it into a kind of pineapple beer known as Tepache. This is mixed with tequila and mezcal to create our ‘Velvet Brew’. Yes, we get the most out of our ingredients. Draw inspiration and products from the kitchen – We’ve cut down on more than half of the amount of eggs we use in our drinks: it’s now about 2 litres of whites. Most people use egg for texture, but we’ve taken advantage of the fact that the kitchen is regularly making chickpea salad, and there’s a lot of cooking liquid left over. 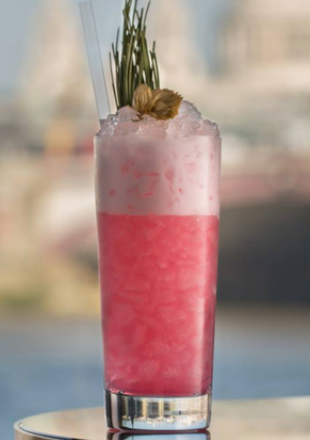 So the chickpea water goes into ‘Mmm Hop’ and ‘Flower of Five’ – a mixture of pink grapefruit vodka, passion fruit flower, leather, lemon and blackberry-flavoured gin liqueur. It has the viscosity and froth of egg whites, but it’s different, and it adds a new kind of flavour too. Yes even citrus – don’t throw away those garnishes As you can imagine, we have a lot of lemon twists left after service is finished, so we infuse vodka and wine with the leftover peel and serve them as afternoon drinks. Slices of orange and grapefruit from our G&Ts and highballs go into the rehydrator and are used in drinks like ‘Jurassic Jungle’, where the dried garnish look works. No citrus gets wasted. In cutting back you can stumble upon something better – Yes, we do still throw away ice from our shaken drinks, but we’ve adopted a method for stirred cocktails from our sister bar White Lyan. Instead of different bartenders giving different amounts of dilution, we have a range of pre-diluted drinks in the fridge, ready to serve. It makes sense to us because you can calculate how much dilution you want, add in the water, and then you’re in complete control. Around 4–5 of our drinks are now pre-diluted. Sustainability is not about skimping on ingredients – We’re part of a luxury hotel, so we’re not about cutting costs. We just want to utilise as much as we can from our ingredients. It’s about being as clever as possible and thinking about them in a different way. Of course it helps the bottom line, but it’s also about expanding our range of flavours, not about reducing our options. For instance, we’ll use the mint stem to infuse drinks – it has much more flavour than the leaves. The right equipment helps – Downstairs we have a couple of water baths to make infusions so much easier. Plus there’s a hydrator and Thermomix food processor. The hotel also has bins for paper, plastic and compost waste. If it’s embedded in the menu, you don’t have to remind staff – It’s not hard to motivate the staff. We have training sessions every Wednesday where we cover wastage and reuse. But the nature of our menu, where one ingredient covers many drinks, means we don’t have any choice when it comes to sustainability. Plus we select people based on personality rather than experience: we want them to be like-minded. So that even if they haven’t worked sustainably before, it’s likely to make sense to them. Be careful how you phrase it – but tell people all the same. We’re working in a luxury environment, so we have to be careful about the words we use. We don’t want to mention to guests that we’re using ‘waste products’ in our drinks. So Ryan [Chetiyawardana, 2009 UK World Class Winner] and Iain [Griffiths] tend to work behind the scenes, telling the industry and, occasionally, the general public about being sustainable. Ian has set up a brilliant website called Trashtiki to inspire people to use their waste. They’re going on a global tour where they carry the alcohol with them, but rely on waste products from bars and kitchens to make the rest of the cocktail. They’re getting the word out!